The following guest packing list for Chile has been submitted by Yvonne Ivanescu. See all our packing list posts here. Chile has a great diversity of natural landscapes, from fantastic mountain peaks to towering glaciers and ice fields to one of the driest deserts in the world. Not only is Chile’s geography extremely varied, but the country is also home to all four seasons. As a result, Chile can be a tricky country to pack for as the contents of your suitcase will largely depend on your itinerary and the season. There are four seasons in Chile: summer (December to February), autumn (March to May), winter (June to August), and spring (September to November). The temperature during these seasons depends on the region you will be visiting as this South American country hosts at least seven major climatic sub-types ranging from (as mentioned above) desert in the north, glaciers in the east and south east, humid subtropical in Easter Island and Mediterranean climate in central Chile. The key to packing for a country with such wide-ranging temperatures is: LAYERS. Invest in a base layer made out of a good, sturdy and moisture wicking fabric (like merino wool). Then add a mid-layer, which can include a fleece jacket, sweater or in colder climates a down/coreloft jacket. Lastly, finish the outfit with a waterproof shell. If you plan on sticking around Central Chile for the majority of your trip during the summer months, than a waterproof shell won’t be needed. But backpackers itching to visit Patagonia (south) and/or take a quick trip to Argentina (it rains quite often in summer) should definitely bring along some good layers and a waterproof shell. NOTE: Patagonia is a beautiful spot but the climate can be quite temperamental. In the summer-time a traveler can experience all three seasons in one single day. Explorers should invest in some good warm layers and a good pair of hiking boots if they plan on hiking in either the Chilean or Argentine Patagonia. In the winter, it is ESSENTIAL that travelers bring warm clothes in their suitcase because the many older buildings in Santiago (capital city of Chile) do not have central heating systems inside their walls. Many establishments (like restaurants and hostels) have a gas heater that provides limited heat during those cold winter nights. In fact, sometimes it can be colder inside the building than outside. Be prepared! Winter is known for its rain while Santiago in the summertime is usually humid and hot without much rain. In June 2013 the Argentine / Chilean border had snow; I kept warm with a down jacket and a hat. Layered clothing is essential for the changing climates no matter what season you travel in. Atacama desert, for example, is hot in the day but temperatures dip below zero in the night-time. It’s always better to be safe than sorry. 1 pair of jeans / 1 pair of insulated leggings – I have heard rave reviews about the Ice Breaker merino wool leggings (such as the Villa Pants). Not only do these products keep you warm and cool when necessary, they are also odour resistant (fewer washes and no smell!). Investing in a good pair of merino leggings / pants means that you can use them for both warm and cold climates. Don’t bring more than one pair of jeans, especially if you are traveling to Chile in the summer time. The temperature coupled with the humidity in Chile can be overwhelming and in the three months that I was living in Chile during the summer, I wore my jeans only a handful of times. Shorts / Skirts / Dresses – Obviously only pack these items if you are traveling to Chile in the summer or if you are making a quick trip to Easter Island. 1 base layer shirt – I would also recommend investing in a good base layer made of merino wool or a sturdy fabric. 5 – 7 tops – depending on the type of season, but bring an even amount of t-shirts and long sleeve shirts. 1 insulated jacket/sweater – This will be your mid-layer jacket. If you are going to invest into one product the mid-layer is incredibly important as it will trap in the heat. Down is incredibly malleable and can fit nicely into your suitcase but be aware that it stops insulating once it gets wet. There is a new fabric out there called Corelot that fixes this problem; it insulates just as well as down but doesn’t fail once it gets wet. These types of jackets or sweaters are great for those cool summer afternoons or can be paired with multiple layers for those cold winter months. 1 waterproof jacket – Also incredibly important during winter months in many South American cities. Nothing ruins a trip faster than getting soaked due to a leaky jacket. If you want a fool-proof waterproof jacket then look for pieces made with GORE-TEX. Arc’teryx jackets, albeit very pricey, are not only fully windproof and waterproof, but they also come with a lifetime guarantee. Rain is almost non-existent during the summer months in Chile, however these jackets are a life-saver during winter when rainy days can go on for weeks upon weeks. 2 pairs of underwear, socks and bras – Quick drying underwear is the best option as it means there is less bulk and they are quick drying (duh). With this model you will be washing a pair of undies (and maybe socks) every night. When I went horseback riding in June 2013, I wore a Helly Hansen base layer (shirt & pants), fleece jacket, jeans and boots. Warm and toasty! 1 pair of walking shoes and sandals – Leave the tennis shoes at home. Instead, opt for good quality walking shoes that are ergonomically correct and support your feet in all the right places. If it’s hot than also invest in some sport sandals. 1 pair of flip flops – These shoes should be used exclusively for showers and the beach. The flat design of flip flops means that they lack the support your food needs which can lead to painful feet after several hours of walking. 1 pair of go out shoes – Traveler’s choice. I personally brought my Steve Madden [HUGE] black wedges overseas and after falling off a stage and eating pavement on the street multiple times, I switched to black flats. I would recommend bringing a black or navy blue pair of shoes as these colors mesh well with other colors and leave your sky-high heels at home. Modest wedges or flats will do just fine. This is also traveler’s choice but don’t overdo it. Chile has succumbed to globalization, meaning that you can find almost anything in Santiago. The city even has two different LUSH locations (where I bought my dry shampoo). Pack all the basics, but in miniature form and then just stock up when you land. >>Check out the best travel toiletries for your hand luggage. The one thing that people should bring with them in Chile is contraceptives. Chile is an extremely conservative country; if you are sexually active I would recommend packing a back-up morning-after pill (emergency contraception) as you’ll need a doctor’s prescription in Chile. Furthermore, if you are prone to any infections (like a yeast infection), heart-burn, indigestion, etc. then bring back-up meds. In the summer, jazz up a boring outfit with a large statement necklace. Unfortunately Chile does not have a vibrant artisan culture, like its Bolivian and Argentine neighbours. As a result bring a few key pieces that can add that extra pizzazz to a boring outfit. Handbags – Don’t go flashy or trendy with handbags. For safety reasons bring a cross-body zipper purse (no flimsy buttons!). Sunglasses, extra pair of prescriptions glasses or contacts – I have horrible eye sight (-4.5 !!!) and I lost my glasses when I was mugged in Valparaiso. I did not bring my backup glasses with me to Valparaiso so I spent the next two days (day and night) walking around in my prescription sunglasses. Don’t make the same mistake I made – it sucked! A colorful scarf and a good warm jacket is all you need. Water Bottle – The drinking water in Chile is safe (especially in major cities) so there is no need to pack any special types of filtration water bottles. Headlamp – Great for hostel stays when climbing in and out of bed without turning on the light. Locks – So important; bring MORE than one lock. Lastly, I would recommend Googling or downloading some language apps on your phone or tablet. Contrary to popular belief, English is rarely spoken by Chileans (even Chileans that run tours and/or hostels). I would also recommend that travelers are highly cautious and extra alert when traveling in Chile (especially to Valparaiso); theft is quite common and rampant so keep a close eye on all your personal belongings. About the Author: A self-proclaimed travel fanatic, Yvonne Ivanescu has embarked on a number of unforgettable adventures across the globe. In 2012, Yvonne launched Under the Yew Tree, a website about travel, green living, food and fashion in South America. She will also be launching her own travel safety book in 2014. For more South American travel tips and safety tips, visit Under the Yew Tree or follow her on Twitter and Facebook. Bring your own new box of birth control pills, because they are extemely expensive here. I was in Chile during their summer months and it was not as humid as home (Pennsylvania), but very hot especially in January. Everything about this post is perfect! The women often wear nice clothes, which I wasn’t very prepared for. Also very true that not many Chileans speak English (I learned this the quickest) and expect you to know/learn Spanish. I love Santiago! I was in Chile in the summer months, and while in Viña and Valparaíso it was absolutely lovely, when I went to Santiago the heat was unbearable! However, that doesn’t mean you can’t enjoy that beautiful city. Don’t forget your sundresses! A good sunhat will come in handy, but if you are not a hat person/don’t have one, I took a hint from the locals and bought a gorgeous parasol just like the ones everyone was using. 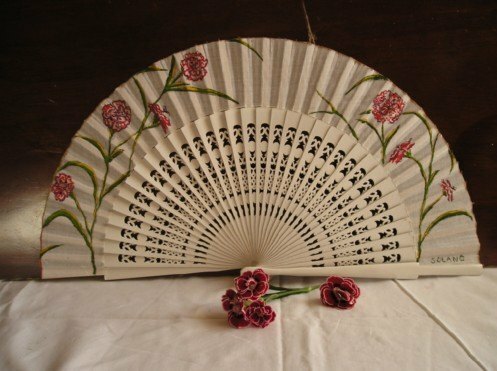 I also love fans -won’t go anywhere without one during the summer months- and mine became the absolute envy of my travel companions. What type of fan did you bring? Was it one for your hotel room or one that you could carry around easily? I am going to La Serena (about 8 hours north of Santiago) from January to March and I am very worried about the heat. Could you tell me about packing in Santiago Chile in early in the month of March? Think of early March as the height of summer, so I recommend light and comfortable items! If it were me, I’d pack nothing but summer dresses, maybe one pair of jeans just in case. Chile is quite conservative, though, so I’d make sure that I include a couple things that don’t show too much cleavage. If you visit the coast, it can get nippy, especially at night. I’d take a nice jacket or a summer coat. I wouldn’t like to forget my parasol (everyone had them last time I was there) or my sunhat! This was so helpful, thank you! I didn’t even realize it would be winter when I booked this trip, so I’m playing catch up! I am traveling to Puerto Natales and Santiago in Early December. I am Chilean. This article has great ideas to get ready. I would add that even in the summer in Santiago its cool in the mornings and at night so you will need a light jacket or sweater.